Get ready, Ottawa! Festival season is here! I've been to my fair share of music festivals. I'm not saying I'm an expert by any means, but my schedule pretty much revolves around music festivals and live shows, especially in the summer. From my experience, there are many factors that affect one's experience at a music festival. 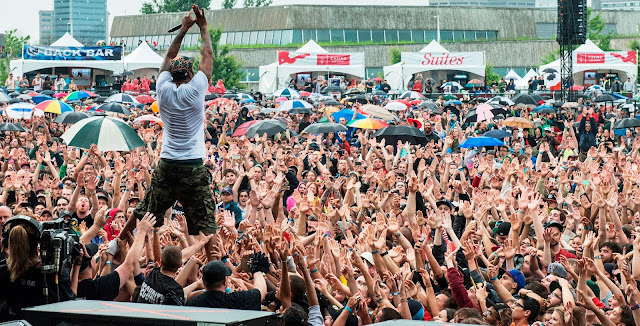 Here are a few tips to keep in mind in order to maximize your festival-going experience. Dress appropriately. Pick your outfit based on your surroundings and based on weather predictions. If you’re going to be standing in a field in the middle of nowhere for an entire day, wearing comfortable footwear would be a wise idea. If the weather is going to be rainy and cold, be sure to bring a warm sweater or jacket. Once you're on site, you don't want to be uncomfortable and/or miserable, wishing you would have dressed differently. Protect yourself. I know we’re adults and it’s not cool to wear sunscreens… But get over it! Bring some sunscreen and apply some regularly. What's worse than getting a bad sunburn? Going back on site the next day to spend an entire afternoon in the sun when you're trying to nurse a bad sunburn. Do you burn easily? Wear sleeves and a hat. Stay hydrated. Yes, drinking an ice old beer while watching live music is pretty awesome. And a lot of us enjoy this activity during music festivals. However, be careful. My advice is to consume in moderation and make sure you drink plenty of water throughout the day. You don't want to be that person who passes out while waiting for your favourite band to start their set. Also, if you end up being that person who passes out from dehydration, that could seriously damper the experience for your friends. So don't be stupid and drink water! Rest. That's right. If you're planning on attending every day of a weekly-long or two week music festival, make sure you rest and get enough sleep so you're in top shape to catch as much live music as possible. There's nothing worse than being overtired and missing an evening of good music and great bands because you can't get off the couch or keep your eyes open. Pick a meeting spot. Planning to meet your friends at Bluesfest? Why not come up with a meeting spot right off the bat, instead of constantly texting your friends back and forth, and trying to locate them in a huge crowd of thousands of people. Identifying a meeting spot early on will help you save time, which means more time checking out the awesome live shows. Make a schedule. If you're like me, you want to most bang for your buck. And because festivals aren't cheap, it's good to catch as many acts as you can. So prepare a daily schedules of bands you want to see, so you get an idea of what your day will look like and what time you have to be on site. Make sure you check what times and what stages each band you want to see are playing at. If you're organized, you'll be able to catch as many shows as possible. Ditch your phone. That's right - Put your phone away! If you're in the presence of one of your favourite bands while they are playing a live set, why would you answer those text messages or check your Instagram? That can wait 'til later! Put your phone away and take it all in! Although it's important to have a phone with you in case of emergencies (or if you lose your friends), why would you play with it during a live show? You may never have the opportunity to see these bands perform live again so take full advantage while you can! Get involved! Let’s be honest: Music festivals aren’t cheap! Not everyone can afford a full festival pass for all the music festivals happening this summer (because there are lots!). One way to save money is to get involved and volunteer. Most of these festivals would not happen without the assistance of volunteers. Volunteers get lots of perks, including free admissions to shows at the festival. The commitment differs from festival to festival. If you work a certain number of shifts, you get to see shows for free. As someone who's volunteered for many festivals, including the Ottawa Jazz Festival and Bluesfest, I can tell you that it's a very rewarding experience. Not only do you get free admission to shows, you get to meet cool people. So if your schedule permits, get involved! So those are my tips for making the most out of your music festivals. So get out there, Ottawa! Be safe, have fun and enjoy that live music! Photo: Wu-Tang Clan at RBC Ottawa Bluesfest. Credit: Steve G.